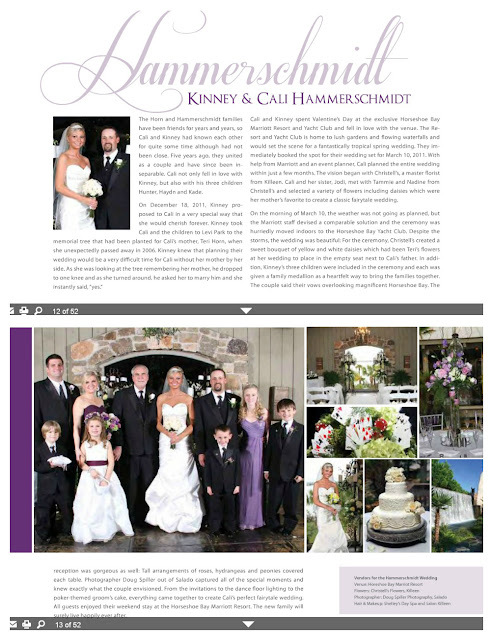 We had the opportunity to work with Cali + Kinney earlier this year, and their wedding has been featured in a Central Texas Wedding magazine. (Although many of the vendors are not mentioned in the magazine since they are not paying advertisers - so we are including them ALL here.) Originally scheduled to be an outdoor wedding at Horseshoe Bay, the ENTIRE vendor team came together to make the indoor event fabulous despite the freezing rain outside. The wedding was beautiful and included Kinney's three children in a family medallion ceremony. A flower was taken from the bride's bouquet as she walked down the aisle and placed on the front row in memory of her mother. Lemon drop martinis with smoking dry ice kicked off the cocktail hour. At the reception, Kinney's children cut in during the first dance which was a very sweet way to continue to include them. People's Choice had everyone dancing, and the poker table had the guests roaring with excitement. Congratulations, Cali + Kinney! 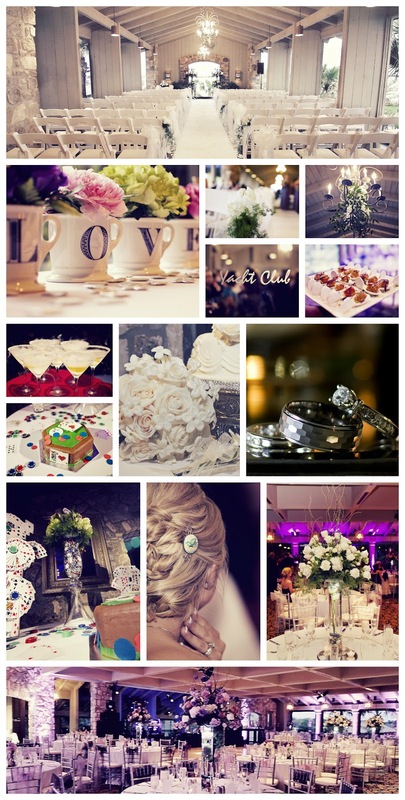 Here is what Cali had to say about our team on WeddingWire.com:"Your Fairy Godmother" wedding services were extremely helpful! I could not have done it without Dawn Earley and their team! They helped me every step of the way from the day I called them to the day of my wedding! This team took so much stress off of me! They knew the answers to my questions before I asked them! Dawn took her time to explain every detail to me about the wedding! She showed up at my tasting with a diagram hand drawn of my reception! She allowed me to fully envision my day! My wedding was planned for outdoors. The day of the wedding the rain would not stop! Dawn rearranged everything and made the most beautiful indoor wedding imaginable! Most would be stressed due to the change of plans but I rest assured knowing Dawn would take care of it! Honestly, having the Fairy Godmothers plan my wedding was the best decision I made! I recommend any and all brides to work with the Fairy Godmothers!!! Trust me, you WON'T regret it!!!" Here is a highlight video from Crooked Tie Studios, too!